We are here to provide the community with a professional business in a prompt and ethical manner. All of our Bail Bond Agents are licensed by the State of Michigan and approved to “write” bail bonds in every county in the state. If Michigan is viewed as a hand, Grand Traverse County is located at the base of separated ring and pinky fingers with the Old Mission Peninsula between them. Traverse City, the largest city in the county, began as a lumber town in the 1850s. Lumber barons viewed the area’s easy access to shipping on Lake Michigan as highly favorable. Traverse City might have landed on hard times after the lumber industry declined, as Muskegon did, except for two factors: tourism and the cherry industry. Indeed, just as the lumber industry was getting underway, it was discovered that cherry trees flourished in the area. The waters of Lake Michigan protected the crop from the severe cold of Midwestern winters and its excessively hot summers. Today, Michigan grows three-quarters of the nation’s tart cherry crop – which is why Traverse City is known as the Cherry Capital of the World. Accordingly, each year more than a half million people attend the city’s week-long National Cherry Festival (ongoing since 1926). With an abundance of lakes and beautiful scenery, the area has become known as a premier vacation community. The vacation atmosphere of places like Traverse City occasionally lends itself to overindulgence and mischief. 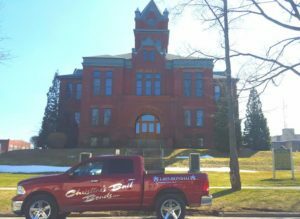 If you find yourself in a tough spot after an evening of revelry, there are people in Grand Traverse County who can help get you out of trouble. Do not hesitate to call Christine’s Bail Bonds if you need this kind of assistance. We are available to help residents and tourists alike.